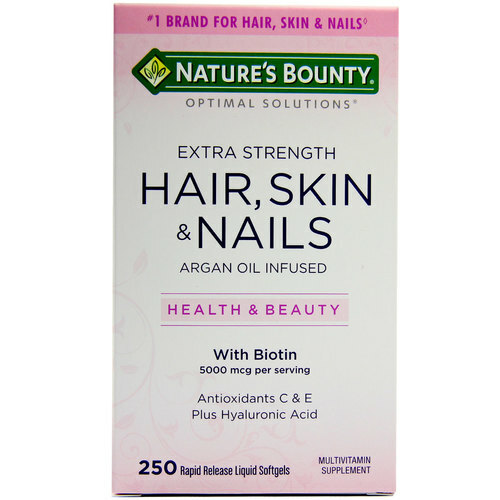 Nature's Bounty Extra Strength Hair, Skin & Nails has only 15 calories in each three (3) softgel serving. Warnings: Contains Soy and Tree Nut (Argan) ingredients. If you are pregnant, nursing, taking any medications, planning any medical procedure or have any medical condition, consult your doctor before use. Avoid this product if you are allergic to yeast. It is advisable to consult your doctor before using biotin doses above 2,500 mcg per day. If any adverse reations occur, stop use and consult your doctor. Not intended for use by persons under the age of 18. Do not use of seal under cap is broken or missing. Accidental overdose of iron-containing products is a leading cause of fatal poisoning in children under six. Keep this product out of reach of children. In case of accidental overdose, call a doctor or Poison Control Center immediately. Recommended Use: For adults, take three (3) softgels daily, preferably with a meal. The customer reviews posted below are based on individual consumer experiences and may NOT necessarily represent what expected results will be from using or taking Nature's Bounty Extra Strength Hair- Skin Nails - 250 Rapid Release Liquid Softgels. These results may not be typical and you should not necessarily expect to receive the same results. Actual results may vary. I have used several jars and really makes the difference since it contains in a single product several vitamins. I'm operated by bypass. My nutritionist has recommended and used it as a vitamin since before bariatric surgery. I had a lot of hair loss, nail breakage and skin problem! Simply the best vitamin complex to aid in the maintenance of hair, skin and nails. I have been drinking for 2 years, and I will continue. Perfect product! After use, my hair growup a lot !! I have been using this product for years, and I never stoped. This 250 pills has the best value. Good product. But it makes my skin and hair more oily. Already used a few months, perfect, a compound of supplements and vitamins with significant amounts, its positive effects are perceived in a short time of use. I intend to continue using. As for the evitamins shopping website, I found it excellent, with a wide variety of vitamin and supplement options, with a clear and objective view. Did the desired effect. Stronger nails.